Hate Crime is on the rise in the UK and you can actively do something about it by donating to this national awareness campaign. Hate Crime is on the rise in the UK and you can do something about it by donating to this national awareness campaign to tackle hatred, prejudice and intolerance. 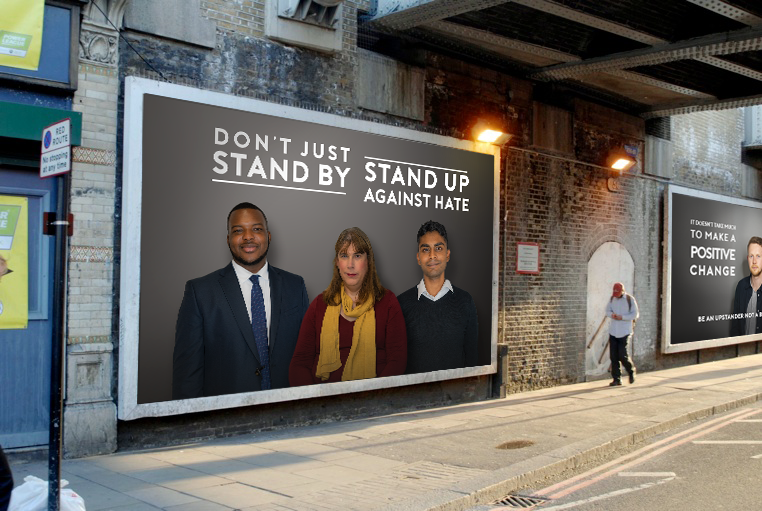 We are asking people across the UK to be Upstanders not Bystanders, and report hate crime wherever they see it. We also hope that the campaign can help people to feel confident in supporting victims of hate incidents and crimes if they come across them. Our proposal is a three-station poster campaign on escalators in Victoria, Paddington and King’s Cross stations. These are stations with high footfalls. The aim is that people going up/down the escalator on the Victoria, Circle, Central and Piccadilly lines, (at these stations), will see the posters. We are also proposing a 6-poster campaign on JC Decaux sites and these sites will be at Manchester Piccadilly station, Birmingham New Street station, Bradford Interchange, Leeds, Sheffield and King’s Cross stations. The sites will be visible when people come out of the station and head towards public transport or taxi sites. By launching this awareness campaign with our partners, we will see this message printed large in communities across the UK.  If you share our vision, then please help us to fund this project. All funds raised will go towards making this campaign reach more people and in ensuring safer and more confident communities. *Disclaimer: All participants in the ‘No2h8’ crowdfunding campaign led by Faith Matters were informed of its aims, objectives, partners & its affiliates, before signing consent forms. Participants were then sent a link to the crowdfunding page, specifying its aims and partners before it entered the public domain. What is hate crime and what can I do about it? Hate crime has been on the rise in recent years. It comes in many forms and can affect any one of us. LGBT groups, ethnic and faith minorities and disabled people, are being targeted, just because of who they are, or how they look. This is unacceptable! Hate crime can also happen anywhere – on the street, in shops, public spaces, and increasingly online. The effects on lives, communities, and people’s long-term mental and emotional well-being can be devastating. Not only is this unacceptable, but it goes against the core values of our country and society as a whole. We’ve been working with communities for over 13 years to help with the issues caused by this harmful behaviour. But if we are to say no to hate, then we need to increase awareness of the real impact that hate crime has on communities and people’s lives across the UK. That’s why we are asking every member of our society to be an Upstander, not a Bystander. It’s not about stepping in, but about reporting crimes to the police or hate crime agencies and taking appropriate actions to comfort the victims. We firmly believe that hatred and intolerance can be reduced by educating people on the impact that hate crime has and asking them to take appropriate actions against it. We can all make a difference in small ways. We will be working with a creative agency to make our Upstanders not Bystanders campaign come to life. We will feature real life upstanders - people who have stepped up when witnessing a hate crime, as well as a number of victims. More people should feel empowered to confront hate! That’s why, to reach a large audience, our campaign proposal includes posters on escalators in high footfall stations - Victoria, Paddington and King’s Cross, as well as a six-poster campaign on prominent JC Decaux sites in Manchester Piccadilly Station, Birmingham New Street Station, Bradford Interchange, Leeds, Sheffield and King’s Cross Stations. Who is working with us on this campaign? We have a number of partners from communities all over the UK, who will be helping us to promote and fund this initiative. Faith Matters is a not for profit organisation working to reduce hate crime through awareness of the issues involved, and promoting the great work being done all over the UK through the #NO2H8 Crime Awards. Faith Matters has been ground-breaking and instrumental in developing new and innovative projects that bring faith communities together and in strengthening faith institutions against hate and extremism. This has also involved strengthening the capacity of faith leadership, working on developing shared values that act as a glue between communities and in developing voices against extremism and extremist rhetoric. We have over a decade of experience on working in these areas and have worked with statutory, community and private sector partners. Ministers in Her Majesty’s Government have also referred to our projects. Please help us to reduce hate crime by sharing this crowdfunding project and donating, if you can. Thanks for your support.